Why don’t I visit you more often? Location, although it’s not close enough to me, it couldn’t be any easier to get to. The smell. The fire that they use to cook some of the food just fills the air. This was our second visit and I just kicked myself for waiting so long to return. We had taken some friends that had never dined there before. They were just as wowed as we were. We started off with a few appetizers for the table. The cheese plate, which is always a hit and the Pork Belly. Now I had pretty much decided I would never order Pork belly ever again, but our sever convinced us it was worth trying. It’s not very big, but it was easy to cut it into 4 pieces. It melted in our mouths. Perfect! For dinner I chose the Tagliatelle. 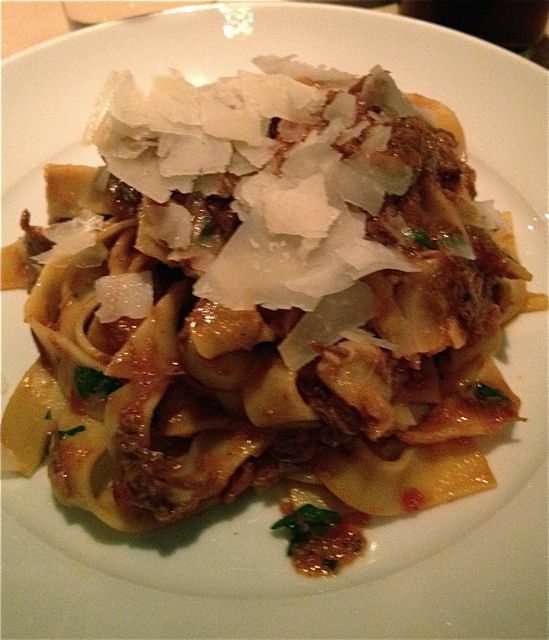 It was a braised lamb ragu over pasta. I am a sucker for any ragu. Please don’t confuse restaurant ragu with the stuff you buy in the grocery store, they are NOTHING alike. Ragus are slow braised meat in a tomato/broth based sauce. I had already decided I was going to have this when our server told us that is the one dish they cannot take off the menu. They get too many complaints, so it stays on all year long. I knew my husband was going to choose the pork dish, so I went with the pasta. We both like to share, so it always works out well. I wish I could remember everything his came with. The menu on their site is different than what they actually served and that’s because they change with the seasons. It did have roasted apples, and these cakes that were like potato cakes but made with something else. Oh I wish I could remember. 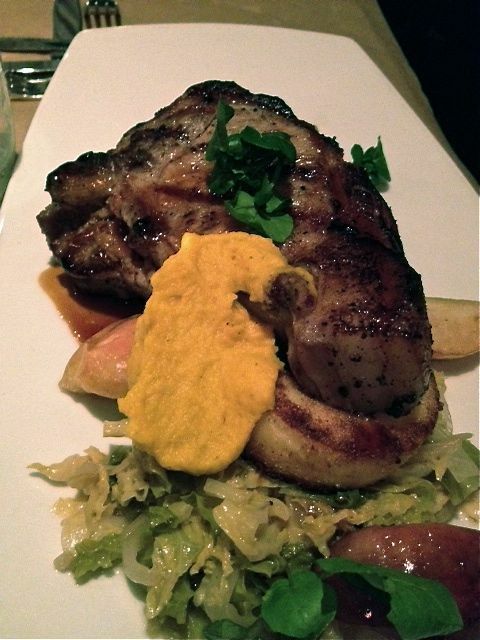 The pork chop was also served atop a warm cabbage slaw. It was such a perfect and filling meal. I was trying to choose a beer and we were talking about what they had. Another guy comes along and goes into full explanation of what each beer is like. This is like my love language, people taking the time to explain every detail. We did not choose a dessert because we were stuffed, but the dessert menu did look pretty good. Atmosphere is incredible. Very romantic and very much for the foodies as you can see the food being prepared. The bar was very empty, even though it was Happy Hour. I would love to go back and try their burger on the Happy Hour menu. Service was above and beyond and everything you hope for when you hit a local Portland restaurant. The chefs take pride in what they create and it’s the servers job to sell it. Ours did just that!! They had a good selection of drinks. I had beer, although they didn’t have much on tap. A great wine selection and they also have a good cocktail selection. It’s located in the SE Industrial area, literally right off I-84. Sorry the pics are so bad. When the lights are low, creating a great ambiance, pics become harder to take. These are just a few pics to show you what I did have. If you like Clarklewis, you’ll love Bluehour. It’s expensive…but really not if you take into account everything that they give you and the extremely good quality of the food. Wow. Try it! It’s another restaurant in Bruce Carey miniature restaurant empire, along with Clarklewis. I was looking at some of your blog posts on this site and I think this site is really instructive! Keep putting up.